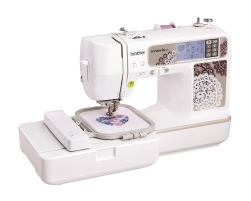 The Brother Innov-IS 955 is a compact and stylish combined embroidery and sewing machine. This is a little gem with truly big ideas that enables beginners and more experienced sewers to achieve outstanding results. With the Brother Innov-IS 955 you can sew and beautifully embellish fashion items and home furnishings. You have 129 built-in stitches at your disposal including utility stitches, decorative stitches and 10 styles of automatic one step buttonhole. You are also able to create and save your own stitches using the LCD touchscreen and combine stitches to give yourself even more options. Stitch length and stitch width are adjustable. The automatic needle threader and drop in bobbin ensure that you can set up quickly and the 7 piece dog feed means that all fabrics feed smoothly. Your work is clearly illuminated by the LED lighting. This exciting machine also features 296 built-in embroidery patterns so you are ready to create fabulous embellishments from the outset. There are 120 border patterns to choose from to frame your work and 6 different embroidery fonts for monogramming. You will benefit from powerful editing features including pattern rotation, mirror imaging and scaling. An audible alert will warn you if your presser foot isn’t down or if you are about to run out of thread. You can explore limitless amazing designs online and then import them to your machine via the USB port. Compact and portable and yet packed with features, the Brother Innov-IS 955 delivers professional looking results whilst allowing you to explore your creativity. This is a clever all-in-one machine that always impresses.